“Russian Animation Industry in the Global Context. Discussion with Leaders of International Children’s Broadcasting and Media Producers” The event was held as part of the “Film” section of the VII Saint Petersburg International Cultural Forum. The participants of the discussion were top managers of the largest Russian and international TV and production centers: Director of the STS Kids channel Lev Makarov, Founder and General Producer of “Storytime” company Yulia Mindubaeva, Director General of Cyber Group Studios Pierre Sissmann (France), Director of RAI Ragazzi Luca Milano (Italy), CEO of WOW! Unlimited Media Inc. Michael Hirsch (Canada), President of the Branscome International Group Catherine Bransky-Morrissey (USA) and media producer Dan Marx (UK). The discussion was moderated by Yuliana Slascheva, Chairwoman of the Board, Souzmultfilm Studios. “Last year we’ve had a similar discussion, and it was met with grat interest. Souzmultfilm had never had such a great number of international contacts and discussions as after the Forum last year. We are very grateful to the Saint Petersburg International Cultural Forum for that, as well as for the opportunity to bring experts with tremendous experience in our industry to the “Film” Section. supporting the Russian animation abroad. This is incredibly important for the industry, because it will allow us to carve out a significant niche on the international market of animation and allow us to compete with international companies. We are confident that Russian animation, of high quality, and creative with many talented people and creative ideas will take up its rightful place in the international animation industry,” Yuliana Slascheva said. General Director of Cyber Group Studios, the largest independent production center for animation projects in France talked about the agreement that his company was planning to sign at the Business Venue of the Forum. 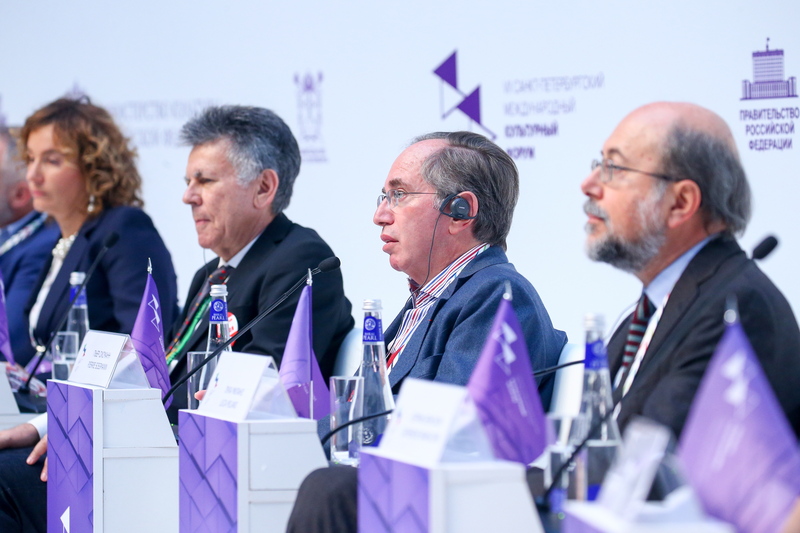 “I am pleased to attend the St. Petersburg International Cultural Forum for the second time. When I came here last year, I already knew that Russian animation studios were quite successful. Over the past year, I learned that the quality of animation films in Russia was in no way inferior to the best international projects. The producers who work here now look for international cooperation opportunities, and I am trying to find ways to establish cooperation between Russian animation producers and leading animation content producers across the globe. I am pleased to announce that on Saturday we will be signing a cooperation agreement with Souzmultfilm. We will work together to bring four animated series to France. Two of the projects were met with considerable interest of major international broadcasting companies,” Pierre Sismann said. Luсa Milano talked about the success of Russian animation films among the Italian audiences and the future cooperation between the two countries. “Co-production and the search for new genres will become increasingly more important in the coming years. We want to invest more in animation film projects so as to develop a strong animation industry in Italy. We are open to co-production with other countries. Co-production with Russian companies can be very fruitful. Recently our channel presented “Masha and the Bear” animation series with great success. Of course, Russian animation is not limited to just this series, but such events help “open up the market”. We will start showing new Russian TV series in December and we have already been discussing future projects,” Luca Milano said. Michael Hirsch, who was among the first in Canadian animation, talked about the factors that can help the national animation industry succeed on international markets. “The Canadian animation industry started growing when two things happened. The first thing that was necessary was to ask the government and the education system to create more courses on animation. It is important to have people who can do animation projects. Secondly, at some point the Canadian government started financing development of local animation, and introduced tax breaks. Then we were able to make our first animated show we called “A Cosmic Christmas” and showed it around the world. We became known in the US, and our studio and the entire Canadian animation industry immediately started growing. With time, Canadian animation became the second largest industry in the world, but without talented animators and governmental assistance this would not have happened,” Michael Hirsch said. Dan Marx shared a recipe for changing the local animation brand into an international brand. is what it takes to achieve success. We need to be able to tie together the producer’s inspiration and fashion with the market vision and client-orientedness of the brand manager. We can only achieve success when this synergy happens. It is only possible when we have a clear vision for the brand. Oftentimes successful brands are based on clear understanding for whom something is being done, and how things work, on the understanding of whose side we are on, and what we bring into this world,” Dan Marx said. The VII Saint Petersburg International Cultural Forum is taking place on November 15–17, 2018. The Forum has been rightfully recognized as a global event, annually attracting thousands of experts in the field of culture from all over the world: stars of theatre, opera and ballet, renowned directors and musicians, public figures, representatives of authorities and business and academic communities. Forum Organizers: The Government of the Russian Federation, the Ministry of Culture of the Russian Federation and the Government of Saint Petersburg. The Forum is developing in three dimensions at the same time. A large-scale Business Program is of interest to specialists in different areas of culture. The Festival Program includes multiple cultural events for city residents and guests of Saint Petersburg. The Business Venue creates conditions for implementing projects and signing agreements in the sphere of culture.